Today Mary Elizabeth hiked with me to Spillway Lake. What could make this amazing trail any better than it was a month ago? Bringing a good friend along to enjoy it, and wildflowers blooming everywhere. Janet just heading out on the trail. Almost immediately the change from when I was here last month was apparent: many wildflowers popped up in the meadows, and the meadows were much drier. 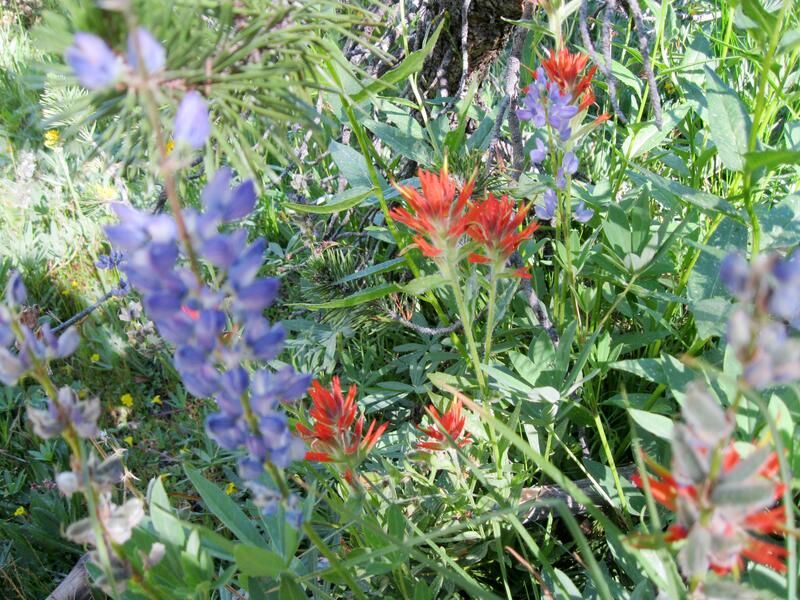 There were lots of red and orange Indian paintbrush and less of the brilliantly colored owl’s clover. There were lupine, gentian and some spent lilies, and the red mountain heather had lost its flowers. 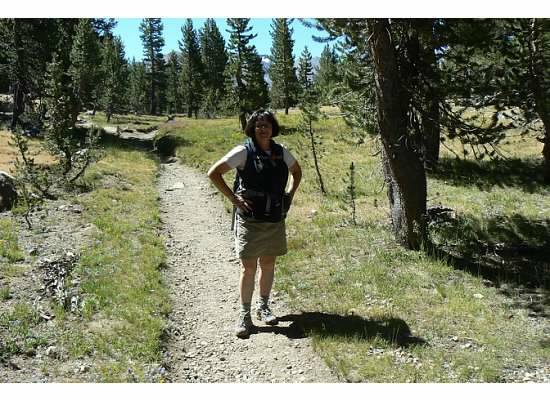 This time we took the Mono Pass trail at the fork in the road instead of continuing straight on the path to the lake. 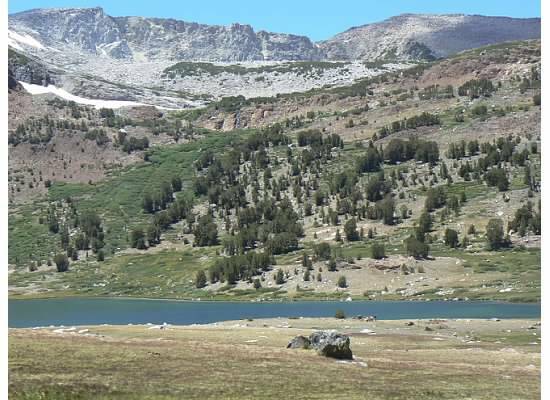 The trail climbed considerably through a lodgepole pine forest and would continue on to Mono Pass. 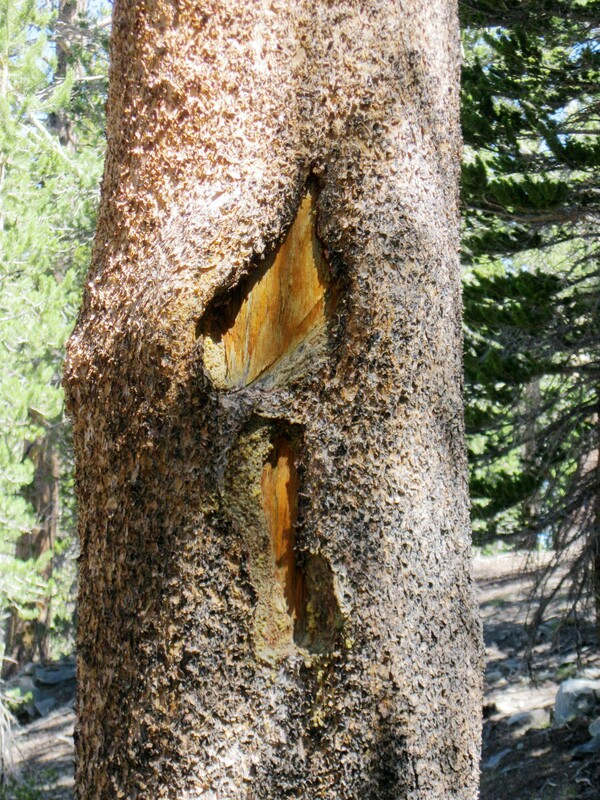 A trail blaze. T is for trail. 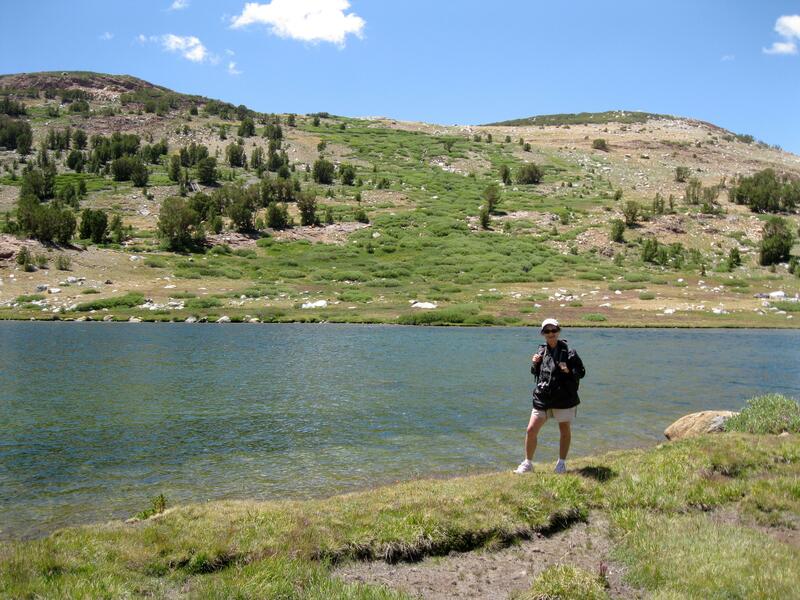 Instead of taking that route, we turned onto Parker Pass which indirectly looped to Spillway Lake. 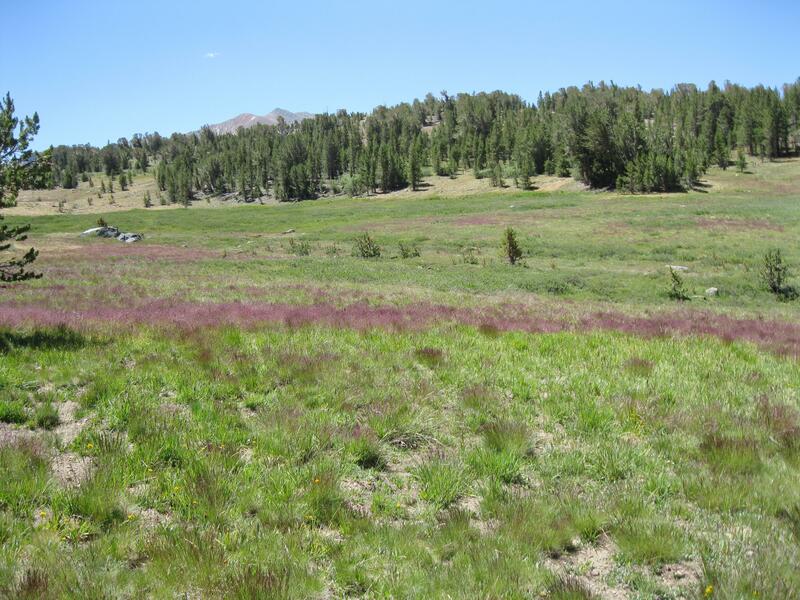 The Parker Pass trail began in a meadow filled with green and mauve-colored grasses. Stripes of mauve-colored rye grass grew in the green meadow. 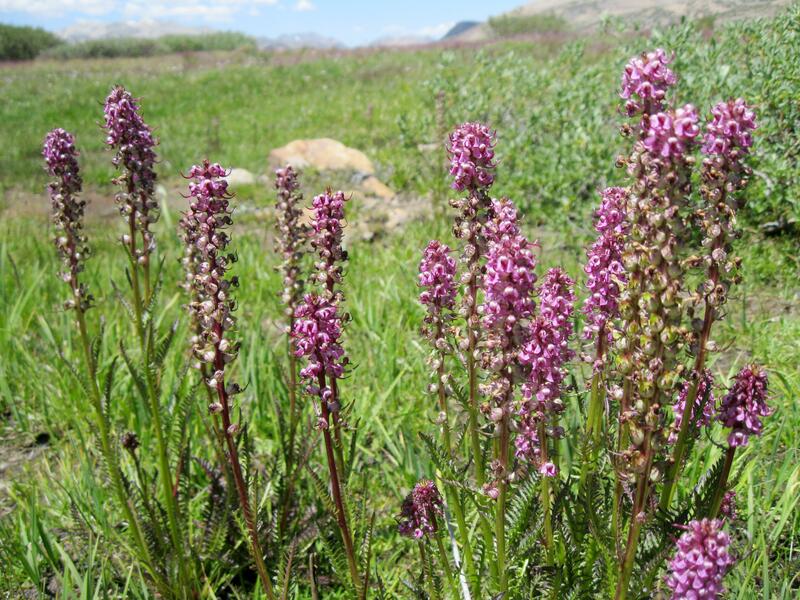 It was windy in this open area, where elephant head lousewort grew. Elephant head lousewort. First time seeing these flowers! 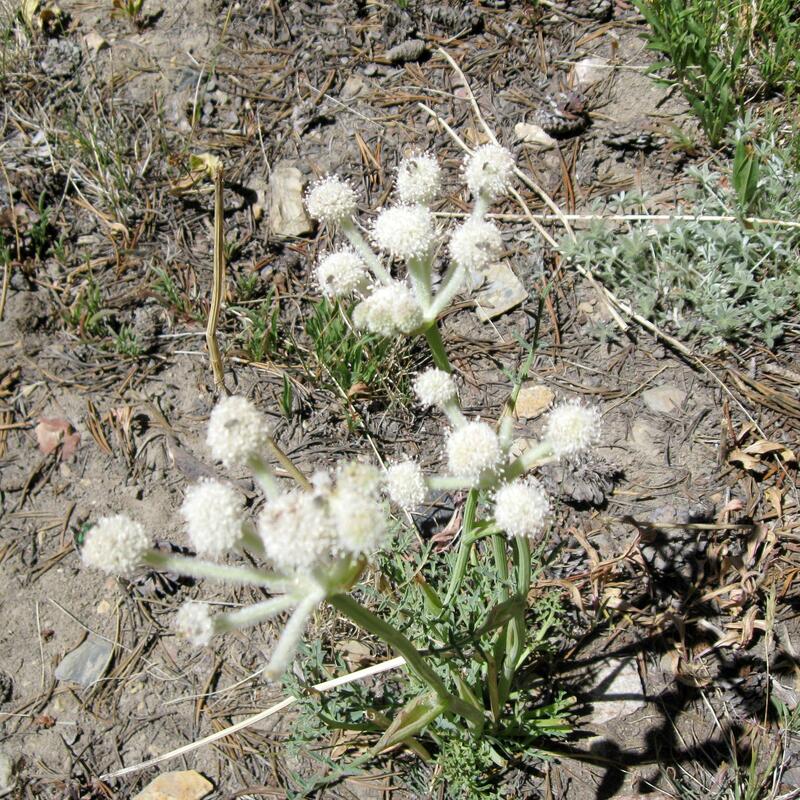 As we left the meadow behind, ranger buttons popped up in the rocky soil and the trail began to climb to nearly 11,000 feet. Ranger Buttons. First time seeing these flowers! Looking northeast, we could see Mono Pass and two small unnamed ponds. Looking east we saw a cabin in the distance. The map said there is a mine shaft there too. Someday I will explore that area. 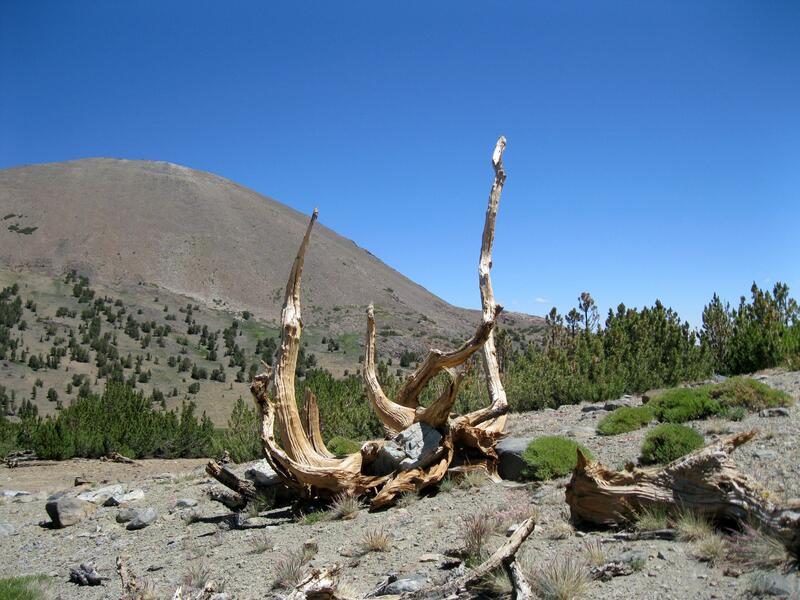 At nearly 11,000 feet, this dead tree was very windblown. Eventually it was time to leave Parker Pass trail and find a way down to the lake. As we did, it appeared that the lake was nearby, but the easy walk down took quite a while. We stopped along the hillside for lunch at a spot with an incredible view. The view of Spillway Lake from our lunch spot. My favorite view of the day. When we arrived at the lakeshore, it was so windy that small whitecaps formed on the water’s surface and none of the fish were jumping like last month. We sat on a rock at the water’s edge until it was time to leave. The trail cut a ribbon of brown through the colorful meadow and led near the rushing water of Parker Pass Creek. 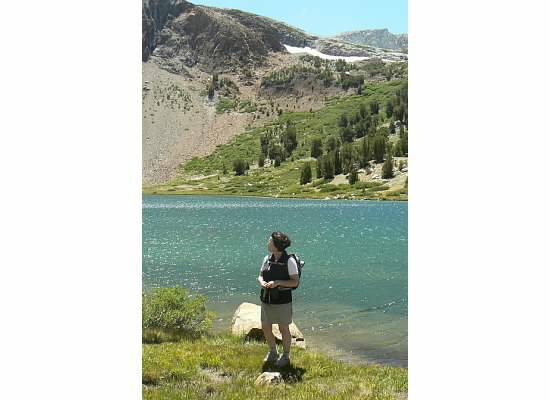 Mary Elizabeth near Parker Pass Creek. We walked to the creek and looked in as water tumbled over the dark rocks. 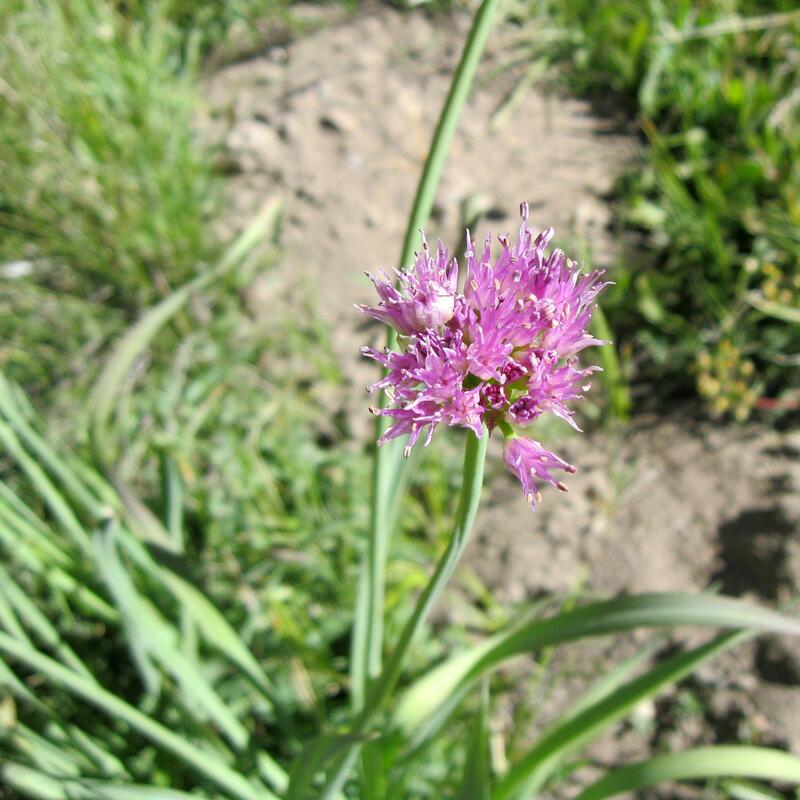 Pacific mountain onions grew along its edge. Whether hiking this trail alone with my thoughts, or chatting the day away with a dear friend, it’s easy to experience God here. Spillway Lake, my favorite lake (so far). 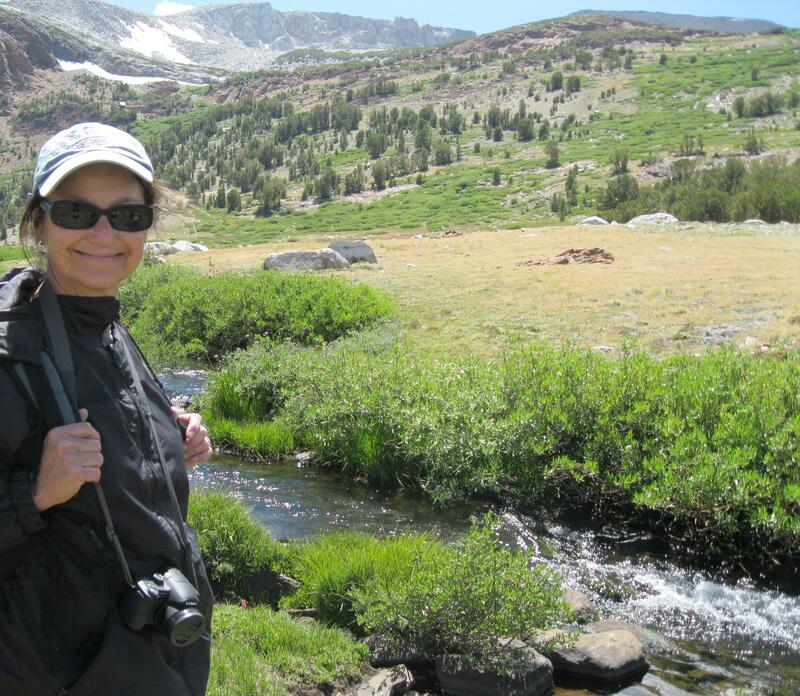 This entry was posted in Yosemite Hikes and tagged Hiking, Mono Pass, Parker Pass, Parker Pass Creek, Spillway Lake, Yosemite on July 21, 2012 by Janet.